The 2018 Cotton Bowl Classic will see the clash between the ACC Clemson Tigers and the Independent Notre Dame Fighting Irish, while the winner will take a place in the 2019 College Football Playoff National Championship. The stake is huge on this one, and the Clemson Tigers are listed as 12.5-point favorites with the total at 55.0 points and the Fighting Irish at +375 money line odds. 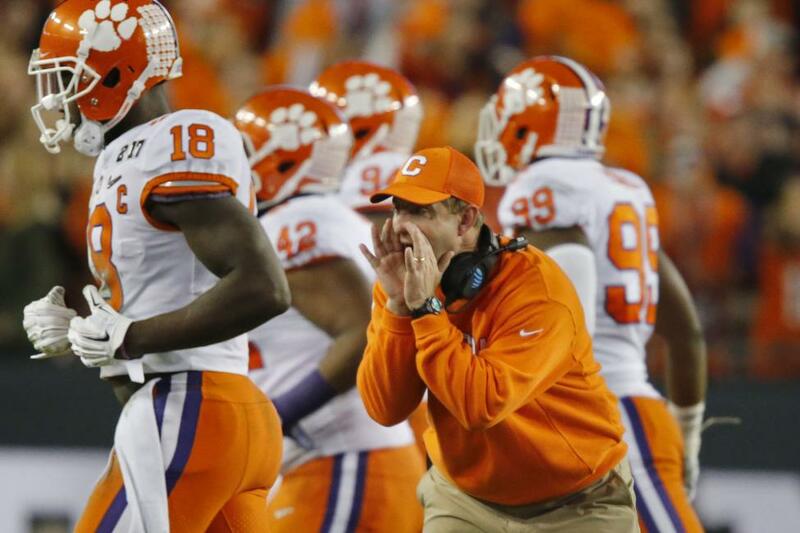 The Clemson Tigers (13-0; 7-6 ATS) have dominated their rivals this season including a 42-10 victory over the Pittsburgh Panthers in the ACC Championship Game. The Tigers had just a couple of serious challenges, barely escaping with a 28-26 win at Texas A&M, and beating the Syracuse Orange 27-23 at home, while they literally smashed all other opponents this year. However, the Tigers are dealing with a serious problem ahead of the matchup with the Fighting Irish, as their defensive tackle Dexter Lawrence should miss the game due to a failed drug test. On Thursday, B-sample test results will determine Dexter’s eligibility, and his eventual absence will be a huge blow for the Tigers’ defense. The sophomore RB Travis Etienne is leading the way for the Tigers with 176 carries for 1463 yards and whopping 21 touchdowns, while the freshman Lyn-J Dixon has added 56 totes for 536 yards and five touchdowns. Another freshman is under center, and Trevor Lawrence has tossed for 2606 yards, 24 touchdowns, and just four interceptions, completing 65.0% of his passes. The sophomore WR Tee Higgins is leading the receiving corps with 52 catches for 802 yards and 10 touchdowns. Clemson is averaging 45.4 points (4th in the country) on 530.8 total yards per game (4th) while allowing just 13.7 points in a return (2nd) on 283.2 total yards per contest (5th). It was 1988 when the Notre Dame Fighting Irish (12-0; 6-5-1 ATS) won their last National Championship, beating West Virginia 34-21 in Fiesta Bowl, and that 1988 squad has been considered as one of the best teams ever in the history of college football. Thirty years later, the Irish will try to become the national champions for the 12th time in their history, but they will have a tall task against the Clemson Tigers. Notre Dame has won half of its games this season by 10 or fewer points including a 24-17 victory over Michigan in the opener, but the Irish have managed to stay unbeaten and earn their place in the 2018 Cotton Bowl Classic. The senior RB Dexter Williams is leading the Fighting Irish with 142 carries for 941 yards and 12 touchdowns in just eight appearances this season. The junior QB Ian Book has thrown for 2468 yards, 19 touchdowns, and six interceptions, completing 70.4% of his passes, and he’s also added 78 carries for 250 yards and four TD. The senior Myles Boykin is leading the receiving corps with 54 receptions for 803 yards and eight touchdowns, while Chase Claypool has added 48 catches for 631 yards and four touchdowns. Notre Dame is averaging 33.8 points (34th) on 456.4 total yards per contest (27th) while allowing 17.2 points in a return (10th) on 331.5 total yards per game (21st). Considering the stats, the Clemson Tigers deserved to be strong favorites to win the 2018 Cotton Bowl and earn the spot in the National Championship Game. Their ground game is superb, and the Irish will have a mountain to climb to slow down Travis Etienne. However, Dexter Lawrence’s eventual absence could be a problem for the Tigers, and it could really damage their mental preparation for the game, so it might be a tougher assignment than many expected. I think the Tigers are a better team than the Irish on all levels, but this 12.5-point spread could be too much. The Irish have some nice options on their receiving corps, while Dexter Williams will be a go-to-guy out of the backfield, so they could make some scores to keep the pace with the Tigers. Clemson should win this game, but I’ll take Notre Dame to cover the spread. Both times when they were close to getting beaten, the Tigers’ games saw less than 55 points in the total. On the other side, seven of Notre Dame’s previous ten games had 55 or fewer points on the scoreboard. I think we’ll see a tough battle with a lot of rushing, and considering both teams’ defenses, I just have to pick the under on this one.